MicroStrategy is an analytics and mobility platform that enables data-driven innovation. When you pair MicroStrategy with the CData JDBC Driver for Salesforce, you gain database-like access to live Salesforce data from MicroStrategy, expanding your reporting and analytics capabilities. In this article, we walk through creating a database instance for Salesforce in MicroStrategy Developer and creating a Warehouse Catalog for the Salesforce data. The CData JDBC driver offers unmatched performance for interacting with live Salesforce data in MicroStrategy due to optimized data processing built into the driver. When you issue complex SQL queries from MicroStrategy to Salesforce, the driver pushes supported SQL operations, like filters and aggregations, directly to Salesforce and utilizes the embedded SQL engine to process unsupported operations (often SQL functions and JOIN operations) client-side. With built-in dynamic metadata querying, you can visualize and analyze Salesforce data using native MicroStrategy data types. You can connect to Salesforce in MicroStrategy Developer by adding a database instance based on the CData JDBC Driver for Salesforce. * Before you begin, you will need to install the JDBC Driver for Salesforce on the machine hosting the MicroStrategy Intelligence Server that your instance of MicroStrategy Developer is connected to. 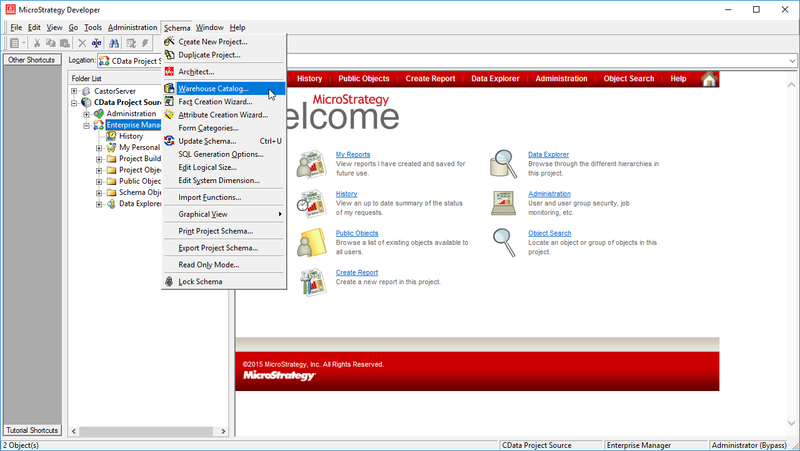 Open MicroStrategy Developer and select a Project Source. Navigate to Administration -> Configuration Managers -> Database Instances and right-click to add a new instance. 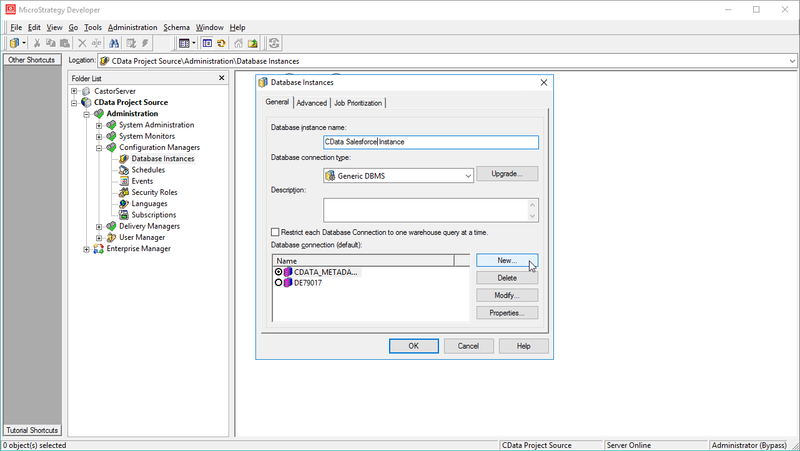 Name the instance, select Generic DBMS as the database connection type, and create a new database connection. 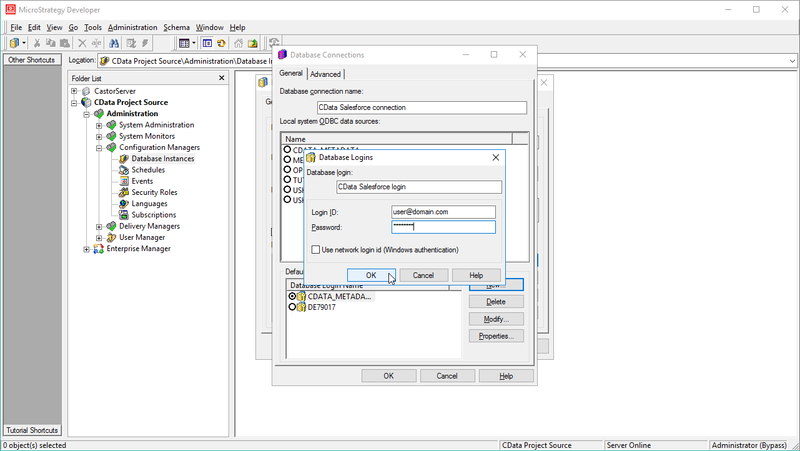 In the database connection wizard, name the connection and create a new Database Login name, setting the user and password for Salesforce. 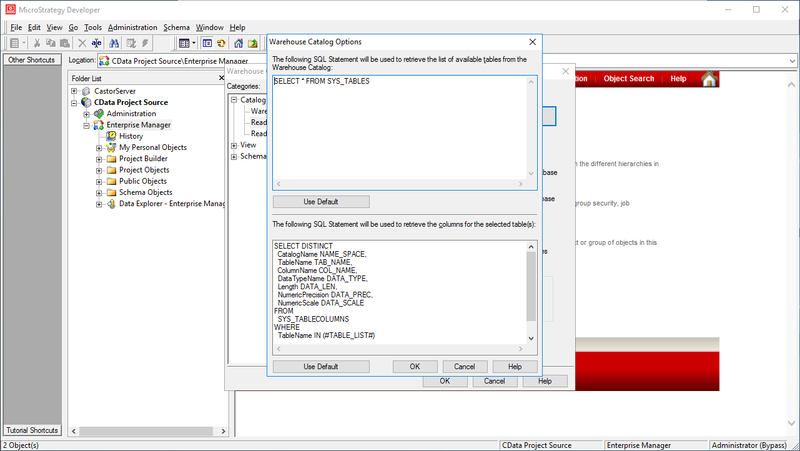 On the Advanced tab for the connection wizard, set the additional connection string parameters as follows. Add the JDBC keyword to the connection string. Set DRIVER to cdata.jdbc.salesforce.SalesforceDriver, the driver class. 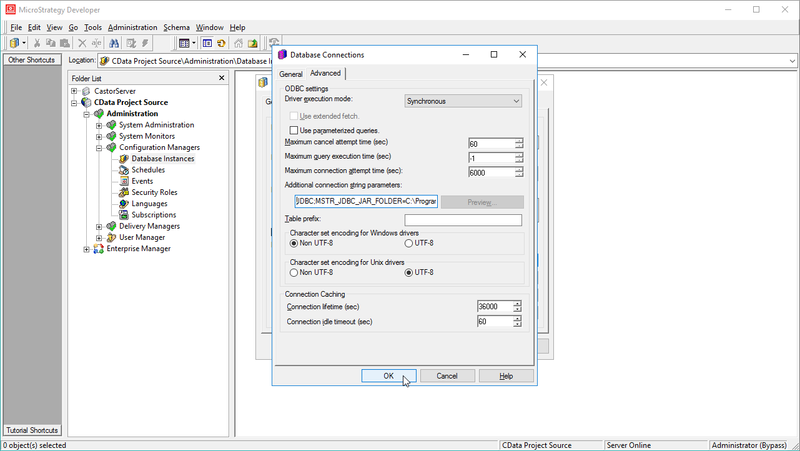 Set URL to the JDBC URL for the Salesforce driver, which contains the necessary connection properties. There are several authentication methods available for connecting to Salesforce: Login, OAuth, and SSO. The Login method requires you to have the username, password, and security token of the user. If you do not have access to the username and password or do not wish to require them, you can use OAuth authentication. SSO (single sign-on) can be used by setting the SSOProperties, SSOLoginUrl, and TokenUrl connection properties, which allow you to authenticate to an identity provider. See the "Getting Started" chapter in the help documentation for more information. 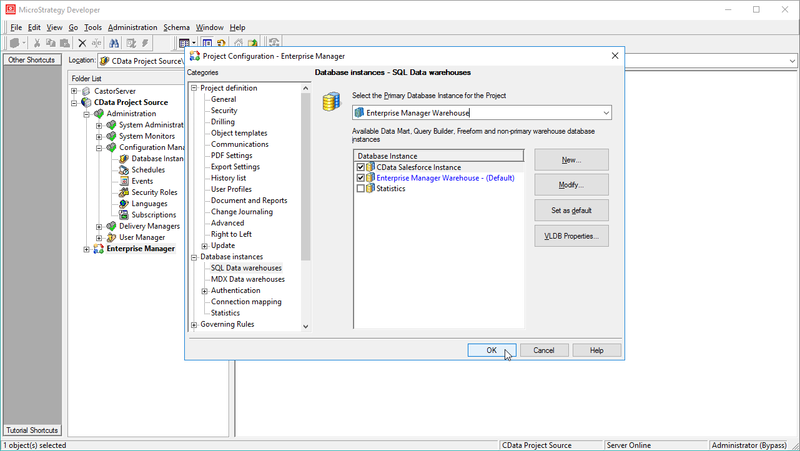 Ensure that you have not selected an ODBC data source (this will trigger MicroStrategy to use the additional connection string parameters to build the database instance) and click OK.
Click OK to close the database instance wizard. 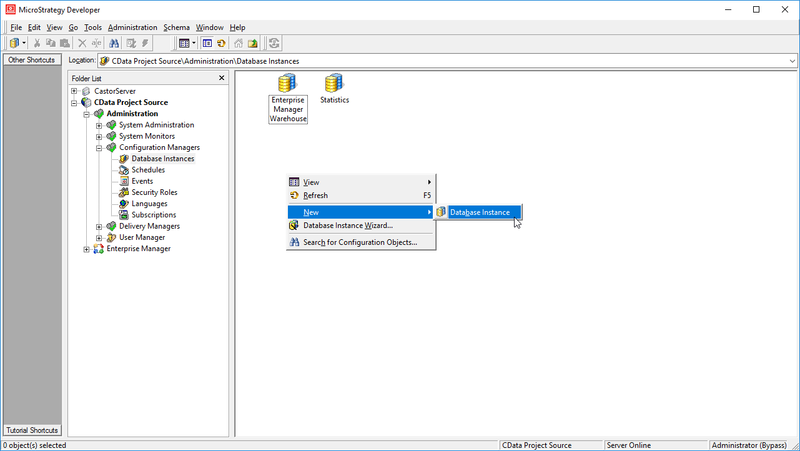 In the Project Source, right-click the project and open the Project configuration. 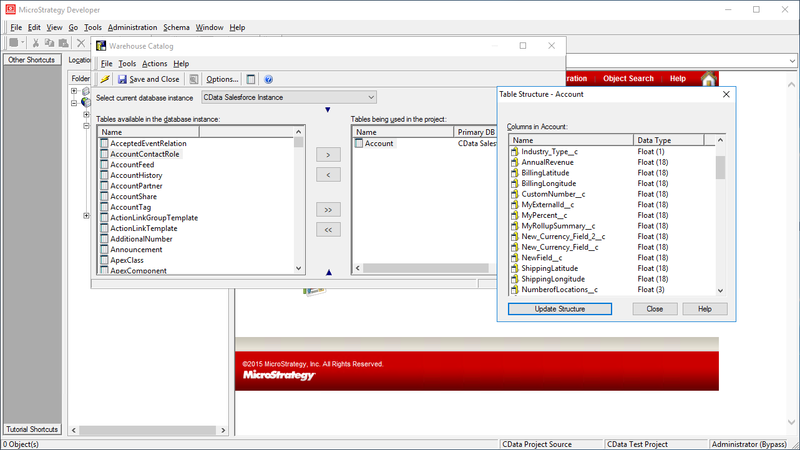 Navigate to Database Instances, select the newly created database instance, and click OK.
Close MicroStrategy Developer and restart the connected MicroStrategy Intelligence Server to complete the database instance creation. With the database instance configured, you will now be able to connect to Salesforce data from the Warehouse Catalog and Data Import. Once you have created a database instance based on the JDBC Driver for Salesforce, you can connect to data from the Warehouse Catalog. Select your project and click Schema -> Warehouse Catalog. Select tables to be used in the project. Using the CData JDBC Driver for Salesforce in MicroStrategy, you can easily create robust visualizations and reports on Salesforce data. Read our other articles on connecting to Salesforce in MicroStrategy Web and connecting to Salesforce in MicroStrategy Desktop for more examples. Note: Connecting using a JDBC Driver requires a 3- or 4-Tier Architecture.